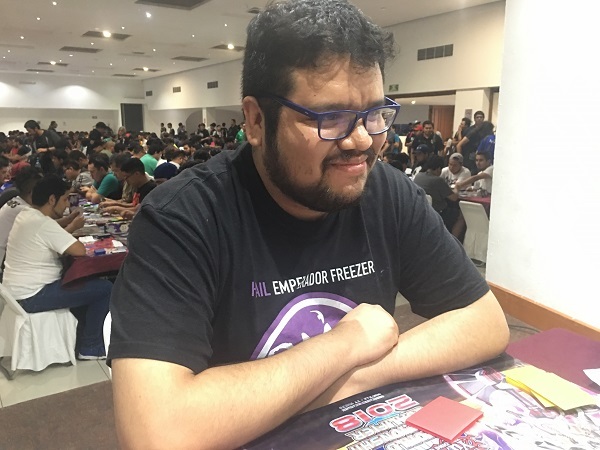 Luis Gabriel Romo Rosas from San Luis, Potosi, Mexico won YCS Guadalajara last October, and now he’s back in Guadalajara looking for a WCQ victory! He’s Dueling against Victor Hugo Perez Ramirez from Veracruz, Mexico in this Round 4 Feature Match! Both Duelists are currently 3-0 in the tournament and looking to remain undefeated. Perez is using a Toadally Awesome Frog Deck, while Romo is using Goukis. It’s time to Duel! Perez started off the Duel by Setting a monster and Setting 3 cards to his back row. Romo opened up with Reinforcement of the Army, Droll & Lock Bird, Gouki Twistcobra, Ash Blossom & Joyous Spring, Ghost Belle & Haunted Mansion, and Blue Mountain Butterspy. He Normal Summoned Twistcobra and then Special Summoned Blue Mountain Butterspy; but Perez flipped Gozen Match and Romo was forced to send his Butterspy to the Graveyard in order to keep his Twistcobra. Romo attacked Perez’s face-down monster with Twistcobra, revealing a Dupe Frog! Romo lost 400 Life Points. Perez Summoned Ronintoadin and then combined it with Dupe Frog to Xyz Summon Toadally Awesome! It attacked Twistcobra, and Romo added Gouki Riscorpio to his hand with the effect of Twistcobra. Perez Set 1 more card to his back row before passing. Romo drew Instant Fusion and then Perez activated the effect of his Toadally Awesome. Romo tried to negate the effect with Ash Blossom & Joyous Spring, but Perez flipped Solemn Strike and gave up 1500 Life Points to negate the effect of Ash Blossom & Joyous Spring and Special Summon Dupe Frog from his Deck with his Toadally Awesome. Perez activated Reinforcement of the Army next, adding Gouki Suprex from his Deck to his hand. He Normal Summoned the Suprex and then used its effect to Special Summon Riscorpio from his hand. He sent both Goukis to the Graveyard to Link Summon Knightmare Cerberus and activated its effect, as well as the effects of his Goukis. He added Gouki Re-Match and Gouki Suprex to his hand in Chain Links 2 and 3, and then destroyed Dupe Frog by discarding Droll & Lock Bird from his hand with his Cerberus’s effect in Chain Link 1. Next, Romo activated Gouki Re-Match to Special Summon Twistcobra and Riscorpio from his Graveyard. He combined his Cerberus with Twistcobra to Link Summon Tri-Gate Wizard. He activated his Twistcobra’s effect, and Romo negated it with Toadally Awesome by sending Toadally Awesome to the Graveyard. He tried to Special Summon Dupe Frog from his Graveyard with Toadally Awesome, but lost out to Ghost Belle & Haunted Mansion. Tri-Gate attacked directly. Perez activated Shared Ride and then activated Paleozoic Olenoides to target it for destruction. He activated Reckless Greed next, drawing 2 cards and allowing him to Special Summon Olenoides from his Graveyard. He then Special Summoned Ronintoadin from his Graveyard by banishing Dupe Frog, and Xyz Summoned Paleozoic Opabina in Defense Position. He activated its effect to add Palezoic Canadia to his hand by detaching Olenoides and then activated Paleozoic Leanchoilia from his hand and Special Summoned Olenoides from his Graveyard. He activated Paleozoic Marella from his hand next, sending Lost Wind to the Graveyard, and Special Summoned another Paleozoic from his Graveyard. He combined 2 monsters to Link Summon Mistar Boy, then Special Summoned Ronintoadin from his Graveyard and Xyz Summoned Toadally Awesome! He attacked Tri-Gate Wizard with Toadally Awesome to destroy it, and then attacked and destroyed Riscorpio. Romo used Riscorpio’s effect to add Gouki Bearhug to his hand. Romo drew a card and Perez Special Summoned Dupe Frog from his Deck with his Toadally Awesome. Romo Special Summoned Junk Forward and then Normal Summoned Suprex. He used its effect to Special Summon Bearhug from his hand and then used Bearhug’s effect to halve the ATK of Toadally Awesome; but Perez Chained his Toadally Awesome’s effect by sending Toadally Awesome to the Graveyard and Setting Bearhug to his field. He added Dupe Frog to his hand with the effect of his Toadally Awesome. Romo Link Summoned Knightmare Cerberus next, and used its effect to discard Instant Fusion and destroy Dupe Frog. He added Gouki Re-Match to his hand and then attacked the face-down Bearhug on Perez’s field to destroy it. Romo added Suprex to his hand with the effect of Bearhug and passed his turn. Perez activated Reckless Greed in the End Phase to draw 2 cards and Special Summon Leanchoilia from his Graveyard. Perez skipped his Draw Phase and then Normal Summoned Dupe Frog. He combined it with Leanchoilia to Xyz Summon Toadally Awesome Linked to Mistar Boy and then attacked Cerberus with Mistar Boy to destroy it. Toadally Awesome attacked directly. Romo drew a card and conceded. Perez wins the first Duel with his Frog Deck, as Romo is unable to fight through Toadally Awesome and Gozen Match! Romo opened up with Butterspy, Suprex, Called by the Grave, Gouki Riscorpio, and Gouki Twistcobra. He Summoned Twistcobra and then Special Summoned Butterspy from his hand. He combined both monsters to Link Summon Isolde, Two Tales of the Noble Knights and then added Twistcobra and Gouki Headbatt to his hand with the effects of his fallen Gouki monsters. He used Isolde’s effect to send Divine Sword – Phoenix Blade from his Deck to his Graveyard and Special Summon Gouki Octostretch, and then banished 2 Goukis from his Graveyard to add the Phoenix Blade back to his hand. He Summoned Headbatt and then Link Summoned Knightmare Goblin, then used the effects of his Headbatt and Octostretch to add 2 more Gouki Cards to his hand, including a Gouki Re-Match. After a flurry of lightning-fast plays, he had Extra Linked! 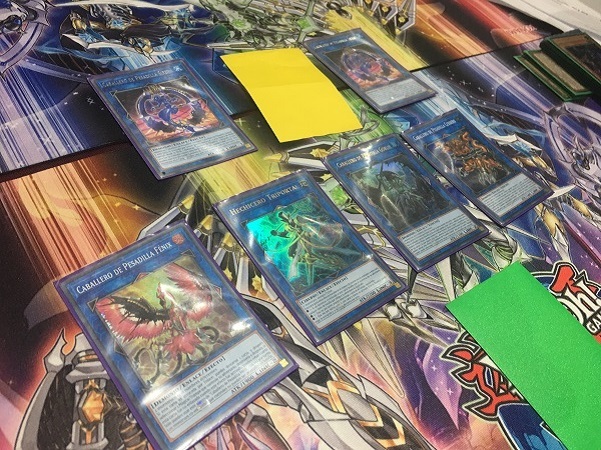 He had 2 copies of Knightmare Mermaid, Tri-Gate Wizard, Knightmare Goblin, Knightmare Phoenix, and Knightmare Cerberus on his field, with a Knightmare Corruptor Iblee Special Summoned to Perez’s field. He Set a back row card before passing. Perez switched his Iblee into Attack Position and attacked the Mermaid to destroy Iblee. He then activated Evenly Matched from his hand, which was negated by Tri-Gate Wizard; but Perez activated another Evenly Matched! Romo banished all of his cards face-down, except for his Cerberus! 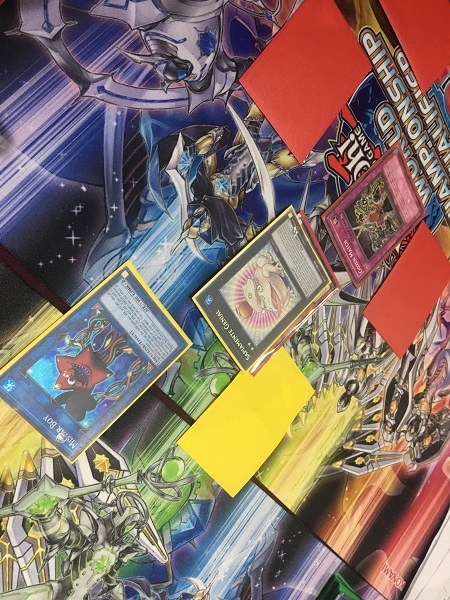 Perez Summoned Swap Frog to send Ronintoadin to his Graveyard, returned the Frog to his hand, Special Summoned it to send Swap Frog from his Deck to his Graveyard, Special Summoned Ronintoadin, and then Xyz Summoned Toadally Awesome. He Set 2 cards to his back row and passed. Romo drew a card and Perez activated the effect of Toadally Awesome to Special Summon Dupe Frog from his Deck. Romo Special Summoned Junk Forward and then activated Instant Fusion. 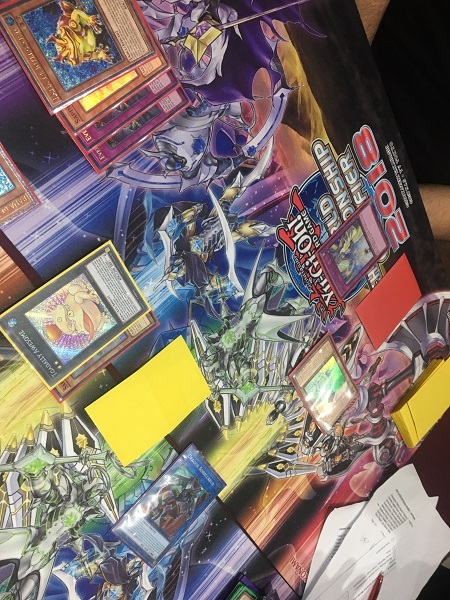 He paid 1000 Life Points to Special Summon Dragoness the Wicked Knight, and then combined all of his monsters to Link Summon Borreload Dragon; but Perez activated Solemn Strike to negate its Summon! Romo promptly conceded, astounded that Perez had overcome his opening turn with 2 copies of Evenly Matched!